Sunday, June 19th marks both Father’s Day as well as the Manitoba Marathon, and unfortunately it appears that the unsettled weather we talked about in Friday’s post has the potential to bring a significant threat of severe thunderstorms to the region. Severe thunderstorms are possible early Sunday morning, however that threat will be conditional on the expected development of thunderstorms in Saskatchewan on Saturday night. The current expectation is that an area of thunderstorms will develop over Saskatchewan Saturday night, expanding in coverage and accelerating eastwards through the overnight period. This area of convection will then move through the Red River Valley with a primary threat of severe and damaging winds as well as large hail and torrential rain capable of producing flash flooding. Rain Moderate Torrential rainfall possible with flash flooding. 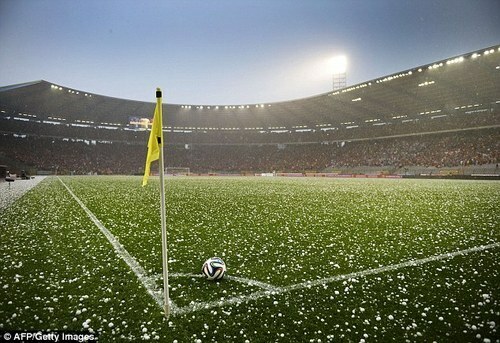 Hail Moderate 2-4cm hail possible. Tornado Low No tornado activity expected. The thunderstorm activity is expected to occur between 4:00AM and 9:00AM, with the primary threat period between 5:00AM and 7:00AM. The timing may adjust depending on the exact speed of the system, but overall this is expected to be a morning event. Alongside the thunderstorms, conditions will get notably more humid as the morning progresses. By the time any thunderstorm or rain showers taper off, things will feel fairly sticky. Temperatures will start around the 16-17°C mark in the morning, climbing to around 23°C by noon, and then on to a high near 27°C in the afternoon. Winds will be fairly light until mid-afternoon when they pick up from the west to around 20-30 km/h, ushering in drier air and providing some relief from humidity. The potent thunderstorm potential for Saturday night and Sunday morning across the southern Prairies will be the result of a potent shortwave that ejects northeastwards out of Montana on Saturday and then rides eastwards along the international border. This will spawn a surface low with cold front draped southwards as cooler air builds in behind the shortwave and warm front extending eastwards across the northern portions of the Northern Great Plains. The surface low will then slide eastwards, gradually lifting the warm front northwards as it goes. This shortwave will [likely] initiate an area of convection over southwestern Saskatchewan that will track eastwards along with the shortwave. The orientation of the warm front will provide plenty of support for the convection with shear profiles that indicate the likely development of a MCS containing bow echoes. Moisture: Dewpoint values near 18°C will be ingested into the convection on Saturday night. This will provide substantial energy for the thunderstorms to work with. Additionally, the high moisture content of the air being ingested will increase PWAT values to over 50 mm, making very intense rainfall likely with any thunderstorms that develop. Instability: Steep mid-level lapse rates will combine with the warm and humid air of the nocturnal inflow to produce MUCAPE values in excess of 2000 J/kg. Shear: 55-65 kt of bulk shear coupled with veering profiles within the convection will support the development of strong, organized thunderstorms. Trigger: Shortwave-induced mid-level destabilization coupled with the development of a strong LLJ. For these parameters, the primary concerns will be hail and rain, however should the storms be able to break through the inversion, wind will rapidly become a significant threat as gusts in excess of 100 km/h will be possible. The steep mid-level lapse rates combined with high MUCAPE values will produce a moderate hail threat with hail between 2-4 cm in diameter possible. The heightened PWAT values make torrential rain likely with these storms, which can result in rapid accumulations and flash flooding. The strong winds & shear profiles of the storm environment make damaging wind gusts possible. Justification for the strong winds despite the nocturnal part of the convection will be the intense storm-relative winds that will be associated with this quickly-moving system. The SR-inflow will likely be strong enough lift the low-level air mass wholesale into the storm, resulting in a surface-based or near-surface-based thunderstorm. 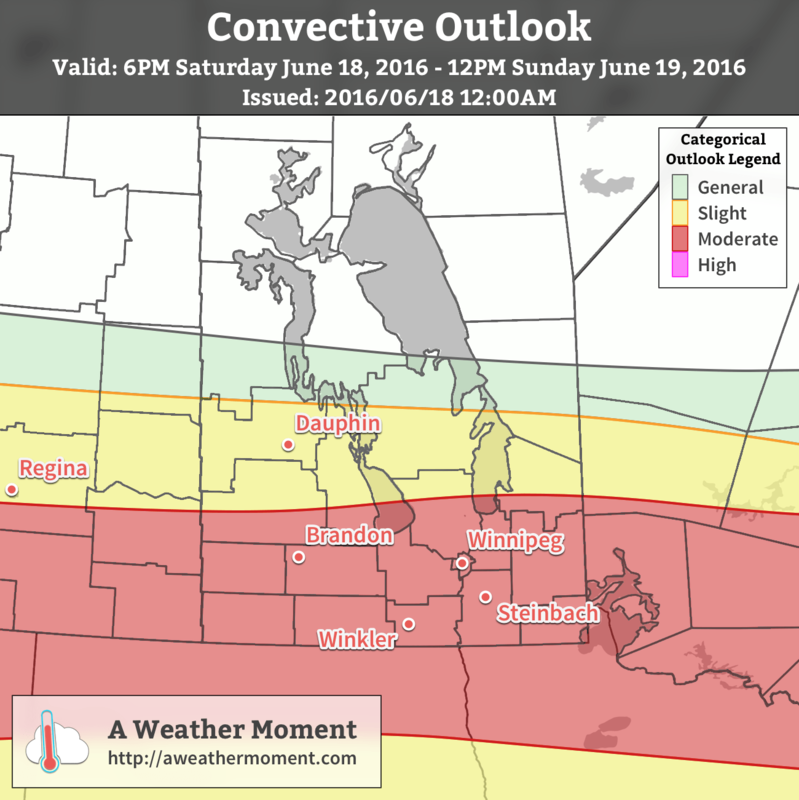 Father’s Day of 2016, and the Manitoba Marathon, face the potential of being remembered for severe thunderstorms if current guidance continues painting the picture it does. Thunderstorm potential is conditional on nocturnal convection developing on Saturday night in Saskatchewan, but if it does, there is a significant threat of severe thunderstorms over Southern Manitoba on Sunday morning. The timing for the primary severe thunderstorm threat will be in the early morning, buffering the starting time for the marathon, with much of the thunderstorm activity expected to be out of the region by 10-11AM. In the wake of this system will be a warm day that will feel fairly humid until westerly winds kick in mid-afternoon, pushing out the humidity and drawing in drier, slightly cooler air for the start of next week. 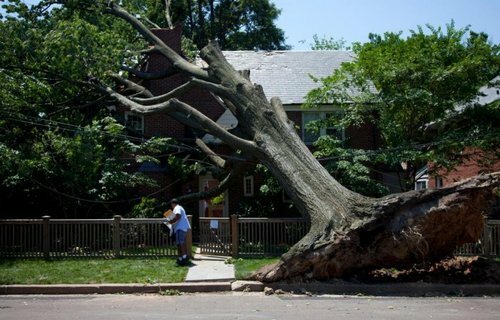 An extremely powerful storm raced across part of the Midwest and Atlantic region the night of Friday, June 29th and into Saturday, shutting down power to millions of people. The type of storm, called derecho (pronounced day-RAY-cho) is a severe thunderstorm that produces severe wind gusts –downbursts that can produce a large swath of damage in a short amount of time. In addition to the wind threat normally associated with this type of storm, the intense lightning also poses a great danger to residents. On this occasion, the derecho moved over 10 states and traveled for over 24 hours before reaching the Atlantic Ocean. Over three-and-a-half million people in the Midwest and Atlantic states were without power following the event. Boundless amounts of trees were uprooted, electrical poles taken down, and mobile homes that flipped, could be seen throughout the storm’s path. In all, 27 people lost their lives due to the storm. Hundreds of others were injured. In the storm’s aftermath, searing heat moved back into the region inciting more deaths as heat stroke became a major concern with no electricity to work with. As of Thursday night, July 5th, almost one week since the event passed through these states, there were still a quarter of a million people without power, mostly people north of Washington DC. Many cooling shelters had to be put in place across the area. 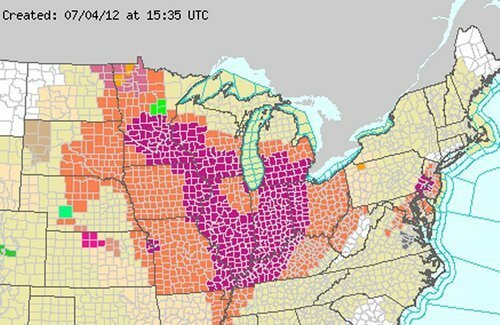 Heat and humidity advisories were posted, urging residents to limit time spent outdoors to no more than a half-hour at a time. Some cities even cancelled July 4th celebrations due to power outages and excessive heat. The tremendous heat and humidity is expected to stay in place throughout most of the eastern US where 3,000 temperature records were already broken this week, as of Thursday. There is a chance of relief from these extreme conditions next week, as a cold front is forecast to slice its way in a southerly motion through the Midwest and Atlantic states. On Monday July 2nd, a few AWM team members headed down to Fargo to chase supercells. 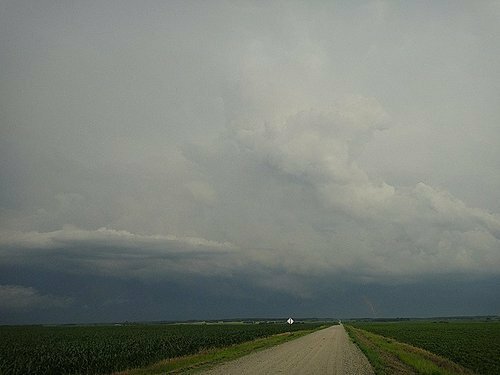 The targeted supercells quickly became a cluster of severe storms as they moved into Minnesota. 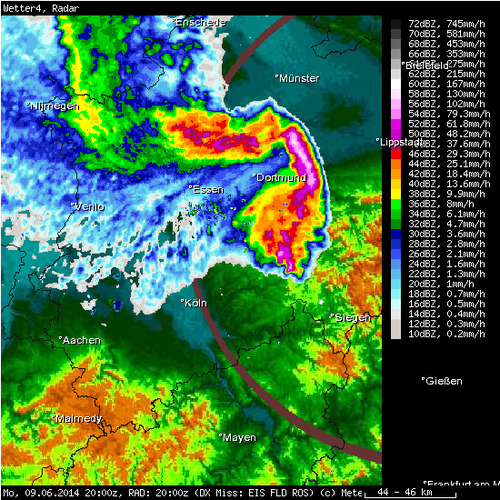 Shortly afterwards, the cluster merged into a bow echo segment, which is very similar to a derecho but smaller in size. Locally, significant damage, similar to what was observed in the Midwest, was reported in Bemidji with the passing of this storm. One boater died as his vessel capsized due to the severe winds and torrential rains. Many trees over 100 years old and power lines snapped easily in the storm’s path, causing widespread power outages locally, in Central Minnesota. Because of all the damage and not much time to tend to downed power lines, the city issued a curfew to residents on Monday night from 11:00 pm to 6:00 am. The Storm Prediction Centre had warned of a bow echo in the days before the event, stressing the severe wind potential. Weather in Central Minnesota this weekend will be similar to Southern Manitoba’s, perhaps a little warmer.